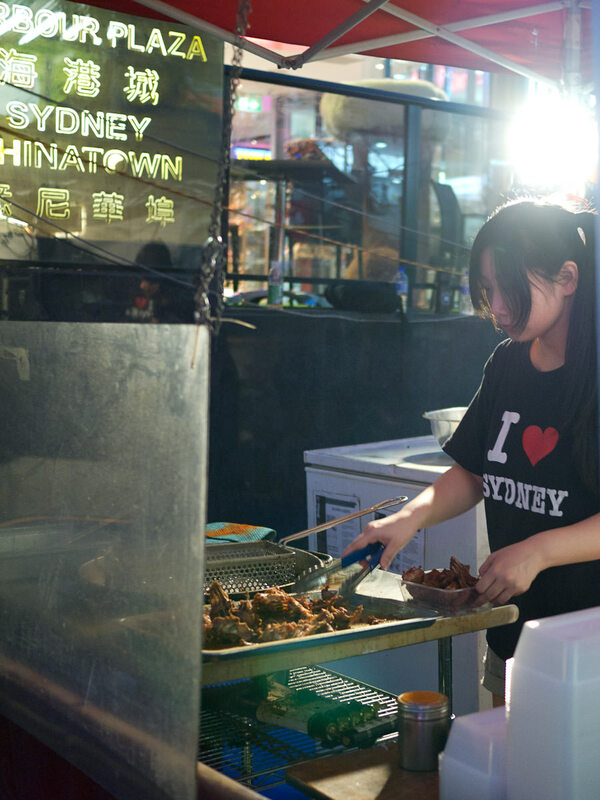 Every Friday night in Haymarket, Sydney, the Chinatown Night Market comes to life, peppering the Dixon Street mall with food stalls, filling the air with delicious smells. It’s a short stroll from the Meriton Apartments on Campbell St where we’re staying. It’s crowded and the foot traffic is slow-moving at times. Chinese restaurant staff stand outside their establishments spruiking for your tummy’s attention while diners slurp on noodles and tuck into sizzling dishes at tables lining the mall (a much better, less pushy advertisement than the people shouting and waving menus at you). But there’s no need to be confined to a restaurant table if you prefer to keep wandering in search of something to eat. Everywhere, food beckons. 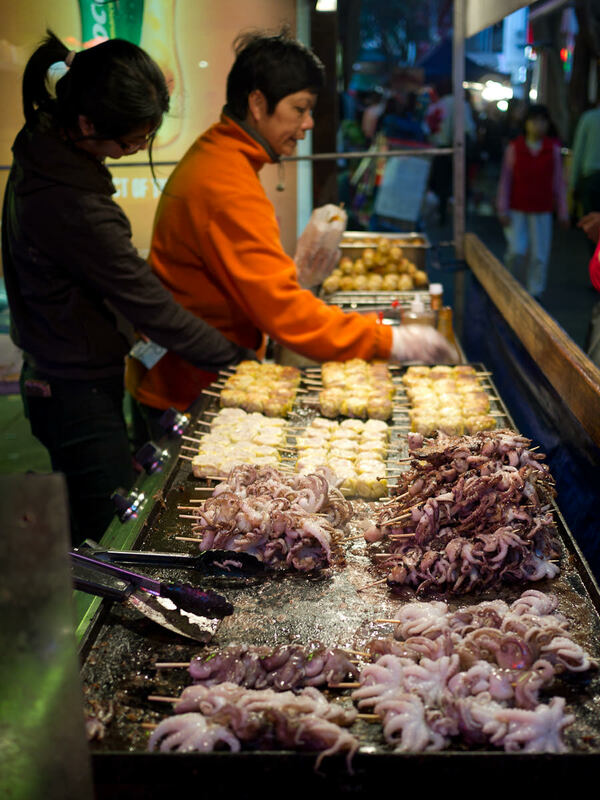 Masses of baby octopus and fish balls are skewered and grilled on a large hotplate. Bak kwa or “long yoke” is a sweet pork jerky. It smells fantastic as I watch the man flipping the squares of caramelised meat. 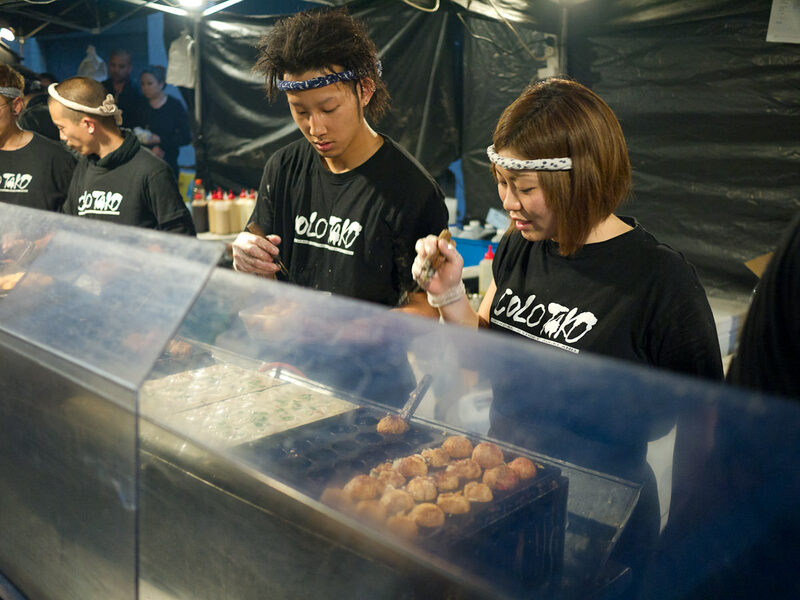 There’s a hot frenzy of activity at the takoyaki (octopus balls) stand. Next door to these guys, the production line continues with okonomiyaki (Japanese savoury pancakes). Money is exchanged for containers of spicy curry while a man works with fresh noodles. Crispy grilled meat is sold by the boxful. 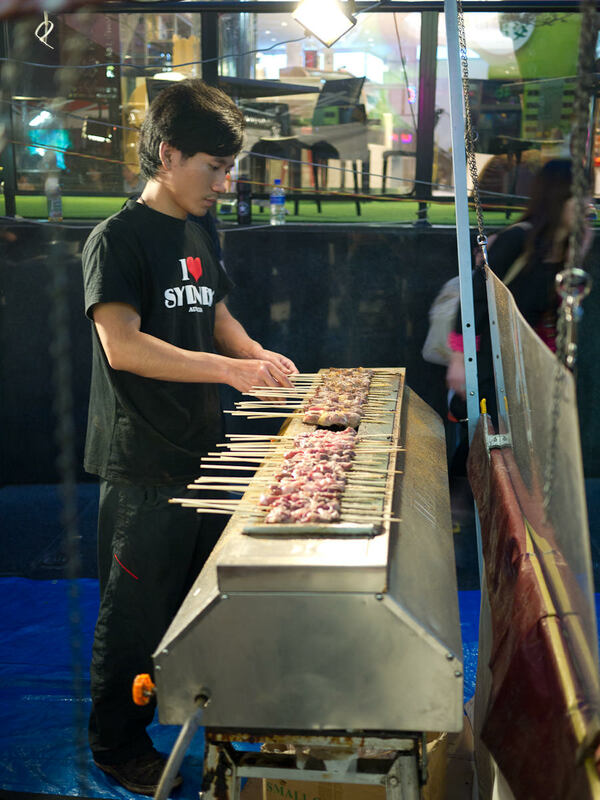 More meaty snacks on sticks, with the grilling of lamb skewers. There are market stalls selling clothes, bags, mobile phone accessories and all kinds of interesting and often gaudy knick-knacks. 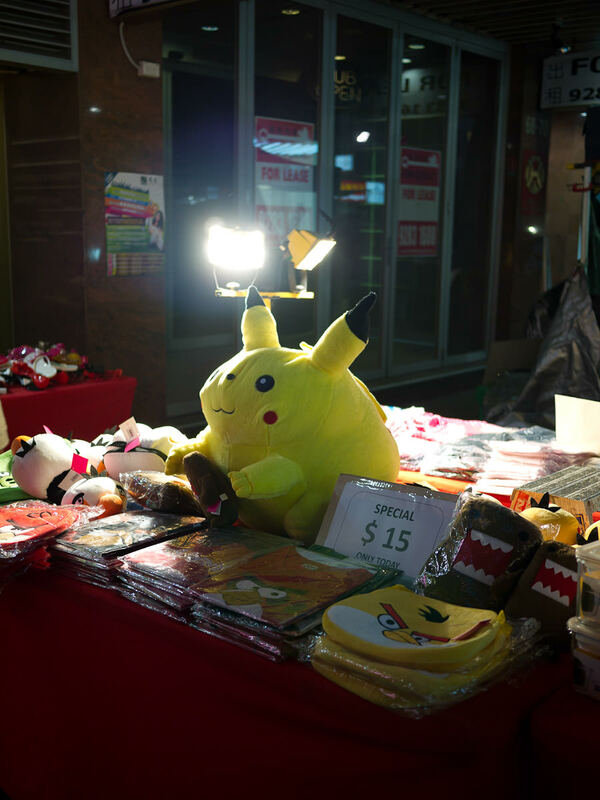 Pokemon, Angry Birds and Domo-Kun are the stars of the show. 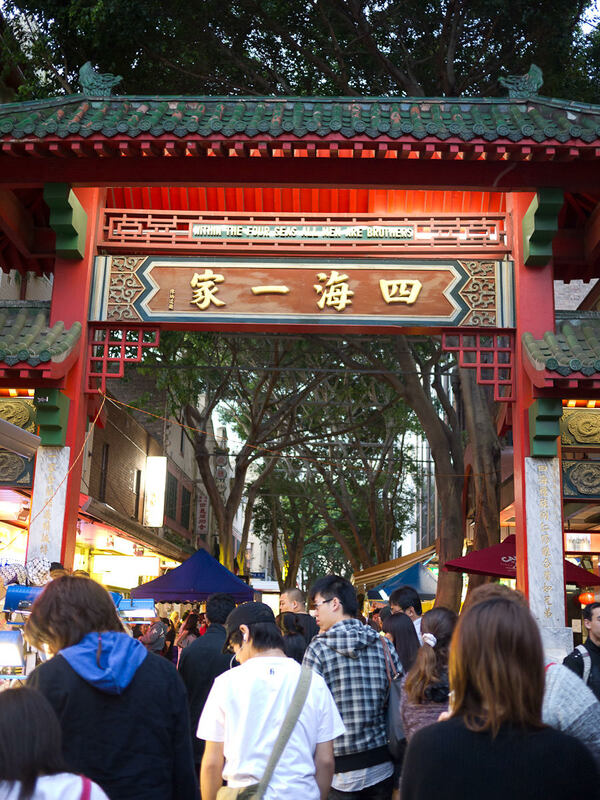 The food stalls are tempting, but we’re here for something in particular: Emperor’s puffs. The last time Jac was in Sydney (without me) a friend took her to a little hole in the wall on Dixon Street in between Emperor’s Garden restaurant and Emperor’s Garden bakery and introduced her to the sweet little snacks called Emperor’s puffs. 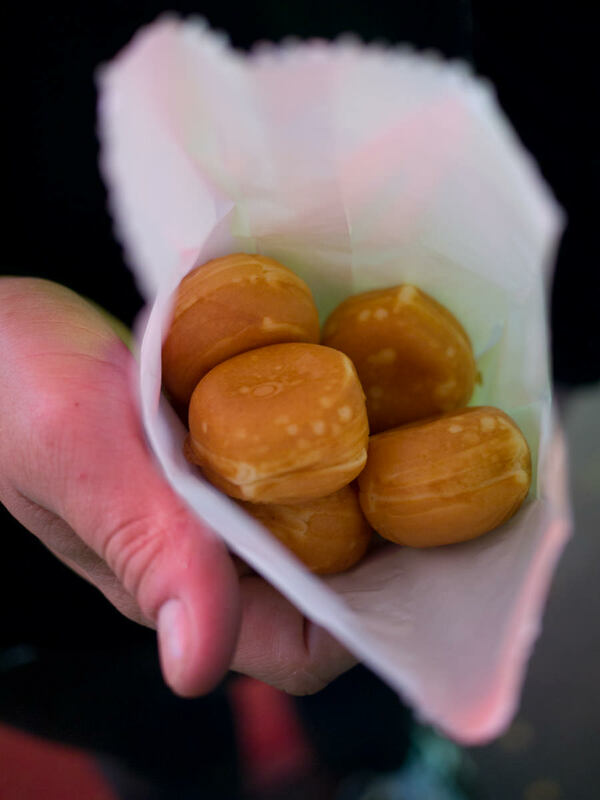 As long as the window is open for business, people line up for the custard puffs. Juji loves them too and is bursting with excitement now that we’re right here outside the little window. Jay waits in line while Juji and I walk around and take photographs of the market stalls (isn’t he nice!). 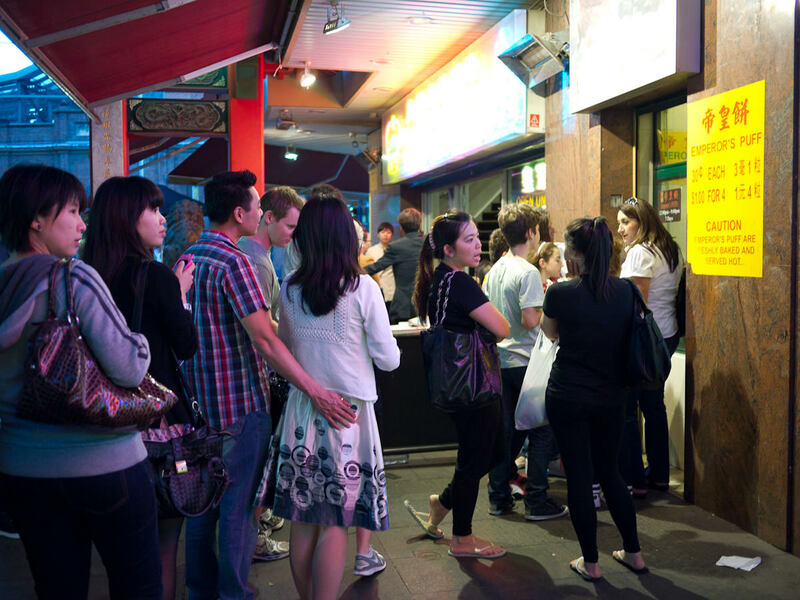 The line moves quickly but doesn’t seem to diminish – Emperor’s puffs are in great demand, especially on Friday night. Almost up to the window! Emperor’s puffs are dainty fluffy doughy pillows filled with egg custard. They’re sold at the window, lifted hot and freshly baked from the puff-making robot machine by a staff member who works deftly with a pair of tongs. These little beauties are a cheap snack, sold for 30 cents per puff or $1 for four puffs. Many people buy them by the dozen, a paper bag filled with puffs. You can get Emperor’s puffs throughout the week, not just on Friday night. We find a spot to sit and share a $2 bag of eight puffs. I’m a pushover for cute tasty morsels and I fall under the spell of Emperor’s puffs too. In the coming days, we return to that little window to get more puffs. Hands up if you’re a fan of Emperor’s puffs! 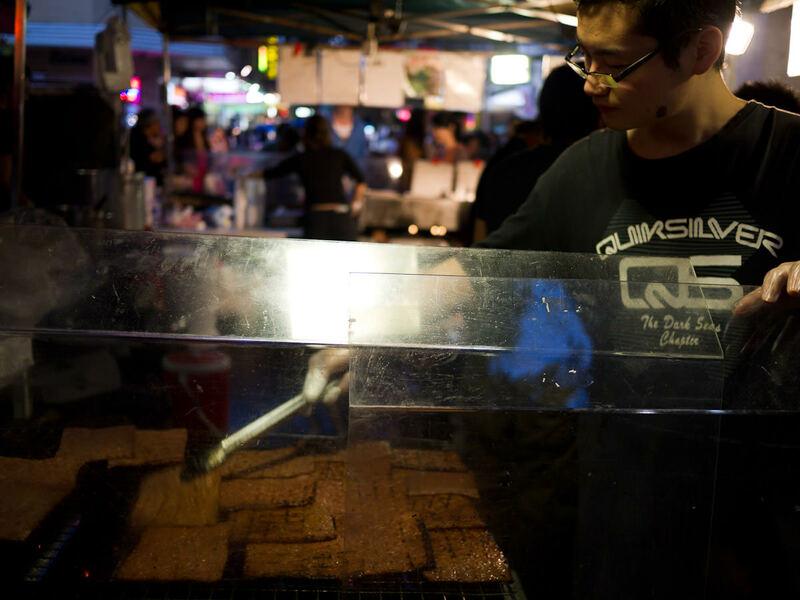 The Chinatown night market is a treasure trove for street food hunters, especially fans of snacks on sticks and lovers of the custard puff. Little Hay Street and Dixon Street Mall, Haymarket. 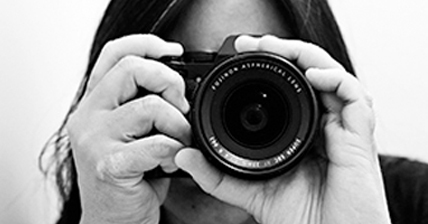 There are more posts from our November trip to Sydney on the way. I’m still also finishing off my series from my trip to Kuching. And of course, there will be posts coming up on eating in Perth too.